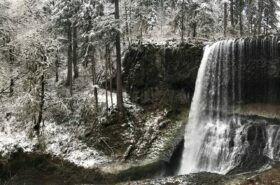 Sometimes I fall into the trap of thinking there are no good places to go hiking near Portland in the wintertime. 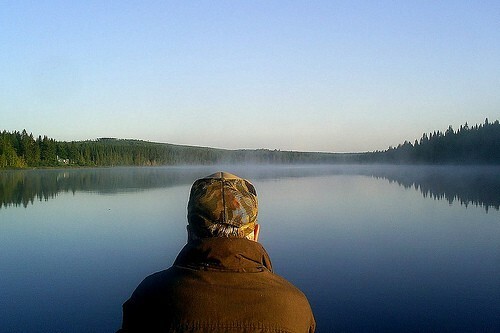 I tend to focus on other things, like eating breakfast and planning trips to warmer places. Of course, this is nonsense. I can’t even really say that the weather is always crappy for hiking, because (A) it doesn’t actually always rain, and (B) Hiking in the rain ain’t that bad, anyway. So here’s a quick profile of a little hike that maybe you already know about: Macleay Park in Northwest Portland. 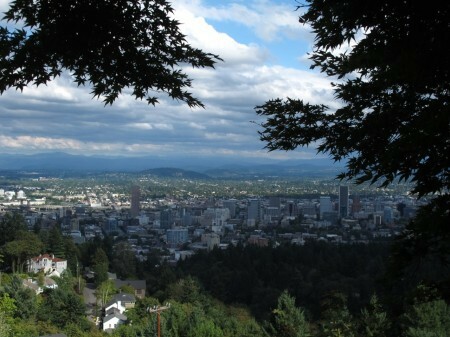 It’s either a short, easy hike along a wooded stream for a mile or less, a 2.2-mile out-and-back to the Audubon Society, or a 4.5-miler to Pittock Mansion and its big view of Portland. 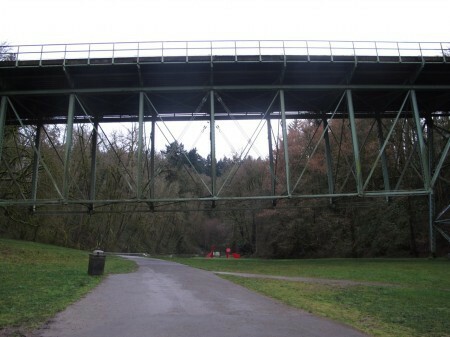 The hike starts in Lower Macleay Park, under the Thurman Street Bridge. To get to Macleay Park, just head up NW Thurman to 28th Avenue and turn right. Go one block, turn left on NW Upshur, and follow it three blocks to the trailhead, at the end of the road. This trailhead can also be reached via TriMet. From downtown, take the #15 bus (NW 23rd Avenue), but make sure it’s headed for Thurman Street and not Montgomery Park. Get off at Thurman and 29th, walk one more block, and descend a flight of steps beside the bridge. 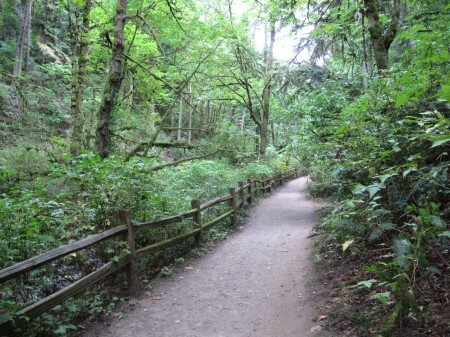 The trail into Lower Macleay Park. First, if the headquarters of the No Ivy League (at the trailhead) is open, it’s worth a look inside. 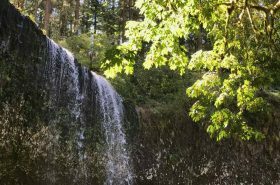 The project has cleared more than 100 acres of ivy and saved some 30,000 trees in Forest Park from invasive English ivy, which creates “ivy deserts” where no native plants can survive. In this building the crews house some of their “trophies,” ivy roots bigger than you can imagine such things being. Gawk, get some water, and head up the trail. 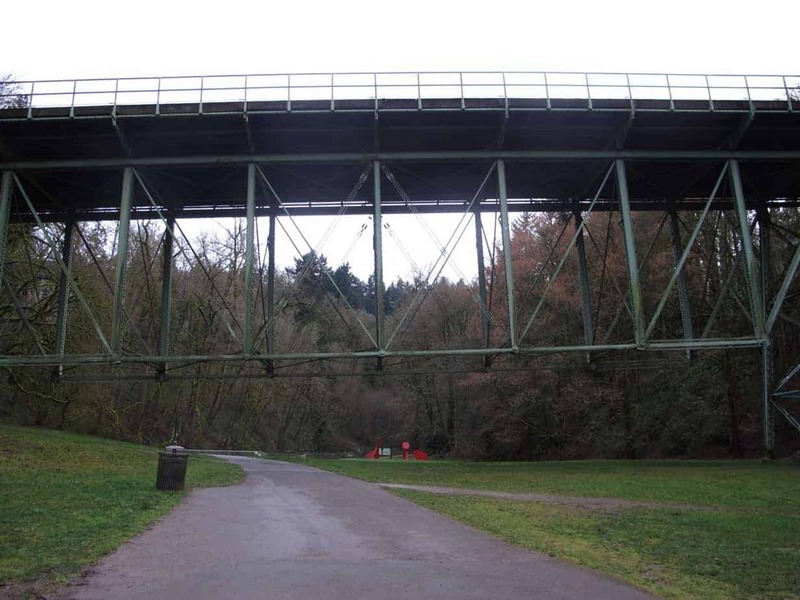 What you’re walking up here is Balch Creek, named for the man who once owned this land—also the first man in Portland to be tried and hanged for murder. Small as it is, the creek was the original water supply for the city of Portland. 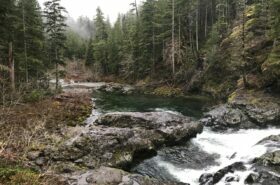 And if that doesn’t amaze you, consider that in 1987 the Oregon Department of Fish and Game discovered a native population of cutthroat trout living in this tiny stream. 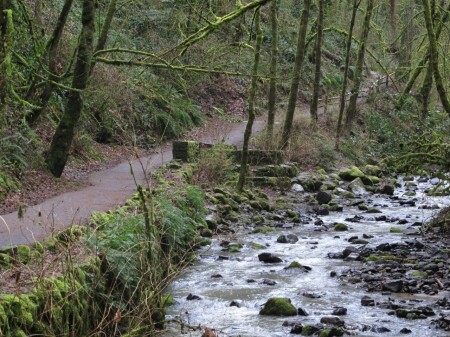 It is one of only two year-round streams in all of Forest Park. Check some of the deeper pools, and you just may see some of the (quite small) fish. Please keep your dog on a leash and out of the water. This land, by the way, was sold by the Balch family and eventually wound up being donated to the city by a prominent Scottish merchant in town named Donald Macleay—apparently because he was tired of paying taxes on it! One of the conditions of the gift was that the paths be wide enough for hospital patients to be wheeled through in the summertime. The first part is flat and easy, along the creek. You’ll pass a Douglas fir on your left that is marked with a plaque identifying it as a Portland Heritage Tree, one of some 300 such trees around town to be forever protected from the saw. This one happens to be the tallest tree in the city of Portland, at 241 feet, and is thought to be the tallest in any major U.S. city. Getting into the real woods. 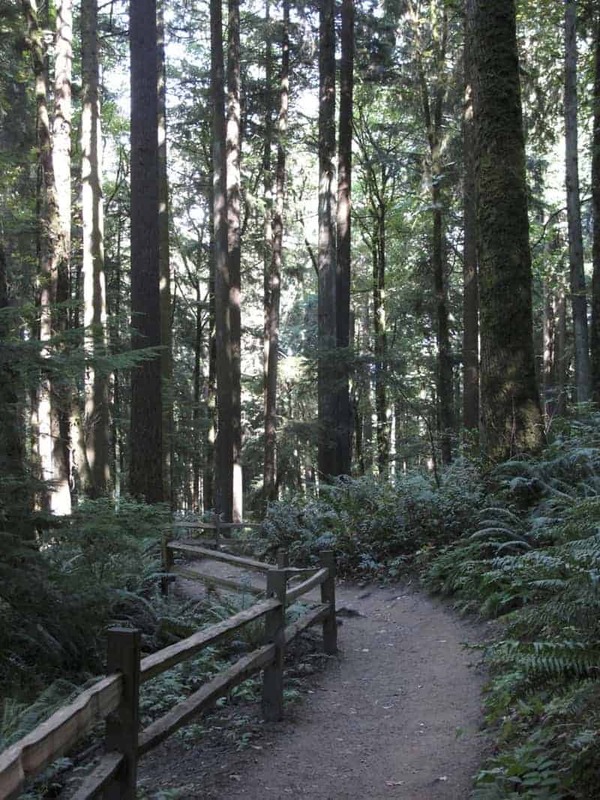 Just past the big tree, you’ll join the 30-mile Wildwood Trail at an old stone building that was a restroom until the early 1960s, when a storm destroyed its pipes by uprooting numerous trees. In fact, legend has it that this house is also the scene of nocturnal battles between the ghosts of Danford Balch and his victim, Mortimer Stump. And if there’s a better Old Portland name than Mortimer Stump, I want to know what it is. Pretty soon after that, you cross the creek and head tup the hill through a few long switchbacks and arrive at Upper Macleay Park. Here, you can turn right ad go check out the Audubon Society, with its own network of trails, a gift shop, and wild birds being rehabilitated. 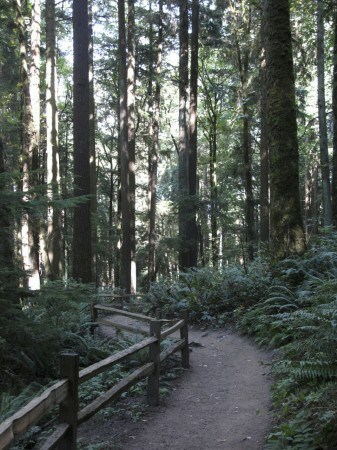 Or you can go left, run across Cornell, and re-enter the forest. After 100 yards, turn right on Upper Macleay Trail. This trail climbs about 0.2 miles, then flattens out. At 0.5 miles, you’ll find a wooden bench with a cool pattern on it. Just past that, rejoin Wildwood Trail, turning right and uphill for the final 0.6 miles to the Pittock Mansion parking lot. This is where you your big view, which you can generally make out even on one of those impossibly “crappy” days. 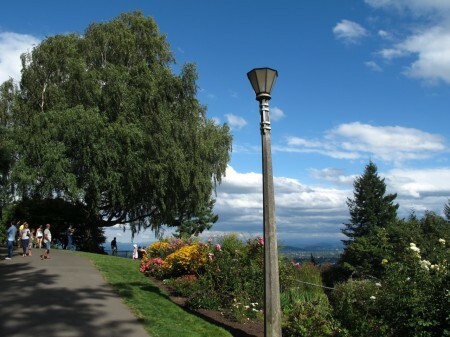 Probably won’t look like this in winter …..
Pittock Mansion, built in 1914 by the owner–publisher of the Oregonian and founder of the Portland Rose Festival, is open for tours daily. For more information, call (503) 823-3623 or visit pittockmansion.org. If you took the bus, you don’t have to walk back the way you came. You can, instead, walk down the road from the mansion to Burnside Street, about 0.3 miles away, cross it (carefully! ), and take the #20 (Burnside) bus downtown. 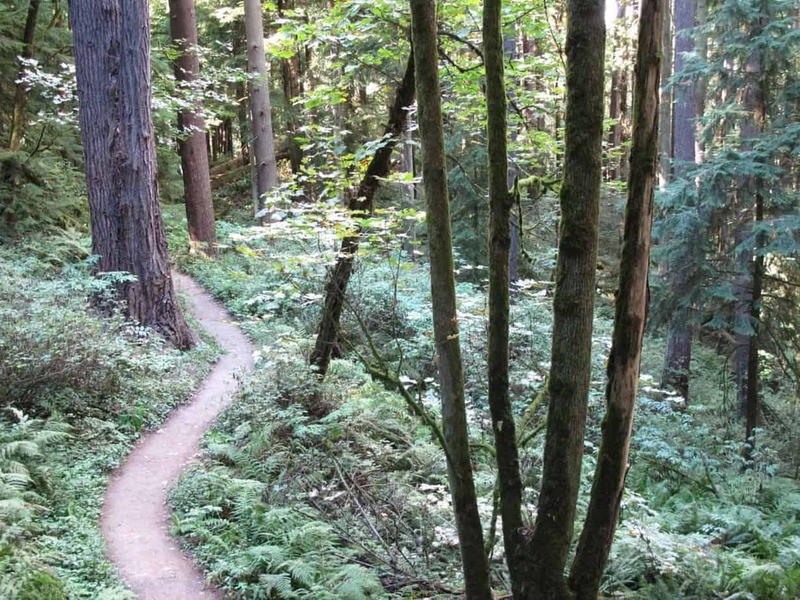 You can also continue 1 mile on Wildwood Trail (descending 300 feet) to get into Hoyt Arboretum, which I’ll write about next week. Okay, see you on the rainy trail! 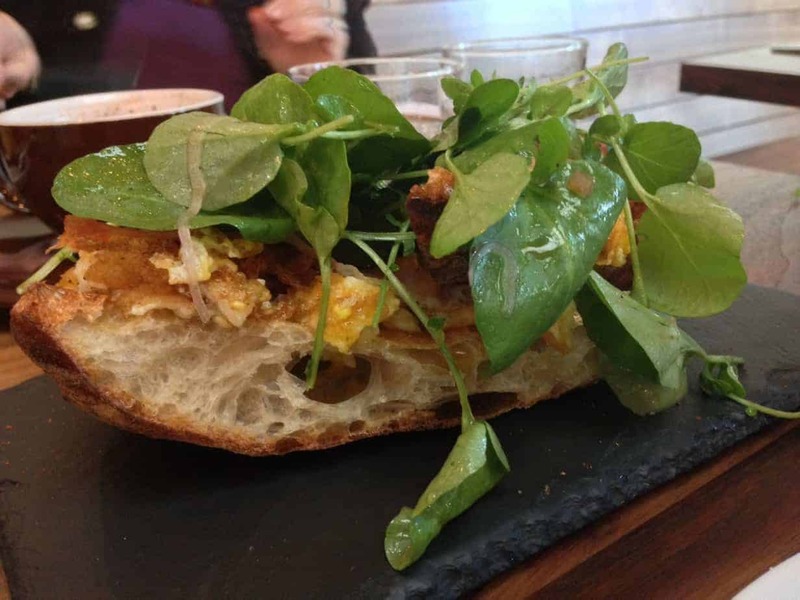 I don’t just hike around Portland, though: I also lead trips to Europe, and I’m the Portland Breakfast Guy. Check out BreakfastinBridgetown.com.